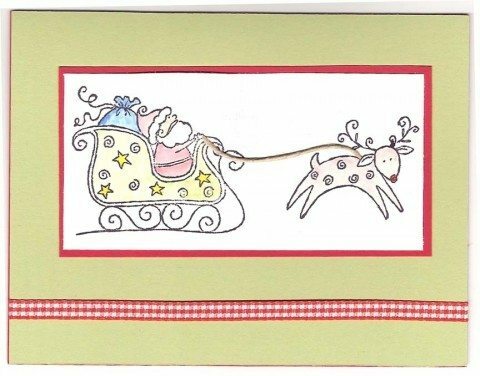 The Christmas holiday is quickly approaching, so it’s time to start sharing some Christmas Card ideas for you stampers out there. This is the first of several to come, so check back often to see some new Christmas cards. One of my favorite color combinations is red and celery. 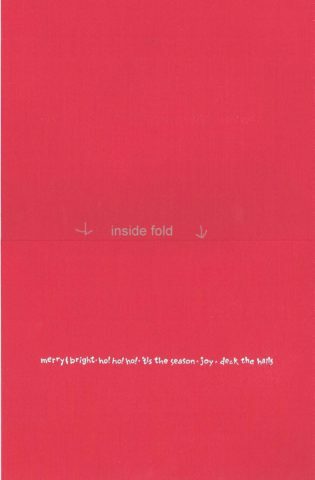 I wanted the inside of the card to be vibrant, so I put the card ‘topper’ on red cardstock and stamped my message using white pigment (craft) ink. Just remember to let it dry completely before handling. The pigment ink takes longer to dry. I poked 2 small holes on the front of the card for the twine. Tape the ends down on the back of the card, and then attach to the folded red cardstock — no one will ever see the ends of the twine. I almost always use Stampin’ Up products, but this look can be achieved using other products as well.